My pilgrimage to Selma, Ala., began at 2:30 Saturday morning. After loading up my tiny rental car, I traveled five-and-a-half hours on zero sleep to be among the number of people bearing witness to the commemoration of one of the most bloody, transformative events in civil rights history. Fifteen miles outside town, I stopped at a gas station to refuel and wash the travel dust away and three middle-aged African-American women burst into the bathroom, their excitement entering before they did. That frantic joy was the overwhelming emotion of a day heavy with symbolism, nostalgia and pride. An estimated 40,000 people descended upon the small Southern town of about 20,000 on the Alabama River. The delicious smell of grilled hot dogs floated through the air along with a harmony of voices singing “We Shall Overcome.” The long line to see President Barack Obama speak snaked through the town’s square and around historic buildings, including Brown Chapel AME Church—where the Student Nonviolent Coordinating Committee strategized and Malcolm X spoke days before he was assassinated in 1965. SUV speakers blared “Glory,” the Oscar-winning song from Ava DuVernay’s Selma, with the heavy bass serving as a soundtrack for a hip-hop generation connecting the dots between the past, present and future. Though people of all races and ethnicities walked the streets with purpose and anticipation, it was a beautiful day to be black and resilient. The nation’s first black president speaking at the foot of a bridge named after Edmund Pettus, a grand wizard in the Ku Klux Klan; civil rights icon Rep. John Lewis speaking from a position of authority mere steps away from where he was left bloody and bruised 50 years ago; and Amelia Boynton—103 years young—had a sparkle in her eyes that rivaled the stars. The optics, though carefully orchestrated, were effective. Only the most cynical among us could have been completely immune to the sight of the Secret Service escorting President Obama to the foot of the bridge as snipers stood on rooftops ready to defend him from any and all threats. The same country responsible for committing atrocious acts of terrorism against black citizens was forced to stand at attention for his arrival. The same country committed to ensuring that its black citizens would never have the power to vote was forced to recognize that a black man holds the highest democratically elected office in the free world. But not everyone was completely enthralled by the president’s presence, including Ash-Lee Woodard Henderson, regional organizer of Project South: Institute for the Elimination of Poverty and Genocide. “What was beautiful to see was that while people were listening to Obama’s speech, there were also people who were spending that time organizing and talking long-term strategy,” said Woodard Henderson. Woodard Henderson gave credit to the Formerly Incarcerated People’s Movement, under the leadership of Rose Sanders and Kenneth Glasgow, for organizing one of the most cathartic moments of the weekend. Woodard Henderson also gave credit to local activists on the ground in Selma who were there before the cameras and will be there long after they’ve gone. And those material conditions were weighing heavily on a lot of people’s minds during the Selma commemoration. While most people applauded his audacity of hope, that question also has deeper, more subversive meaning that can be applied to contemporary times. What could be more American than open season on black people? What could be more American than being black and terrorized by those sworn to serve and protect us? What could be more American than the very same Voting Rights Act signed into law in response to Bloody Sunday now being under attack while bloody Mondays, Tuesdays, Wednesdays, Thursdays, Fridays and Saturdays occur in too many black communities? What is more American than politicians pontificating about progress in a town where 40 percent of residents live in poverty? I had the chance to speak to Michael Brown Sr. while in Selma. His son’s death at the hands of former Ferguson Police Officer Darren Wilson in August sparked this generation’s Selma, and there he was, standing alone amid it all. After we talked about his son, I asked him why he felt the need to travel to Alabama, and his purpose was clear. No, it’s not over. 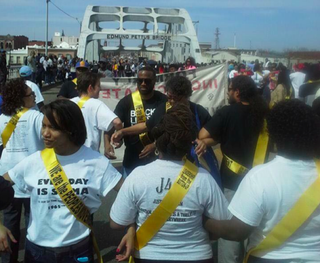 Selma is now in communities all across this country. The conversation is no longer simply about how far we’ve come, but recognizing how far we have to go, something that President Obama also acknowledged during his speech. And to paraphrase a conversation had between Rep. Terri Sewell, the first black congresswoman from Alabama, and Amelia Boynton, which she shared with us in Selma: We better climb down from the shoulders of history and get to it.